Devices that behave “intelligently” are becoming commonplace and artificial intelligence (AI) has quickly become a part of our lives. Logic Programming (LP) is one of the technologies that enables AI work. 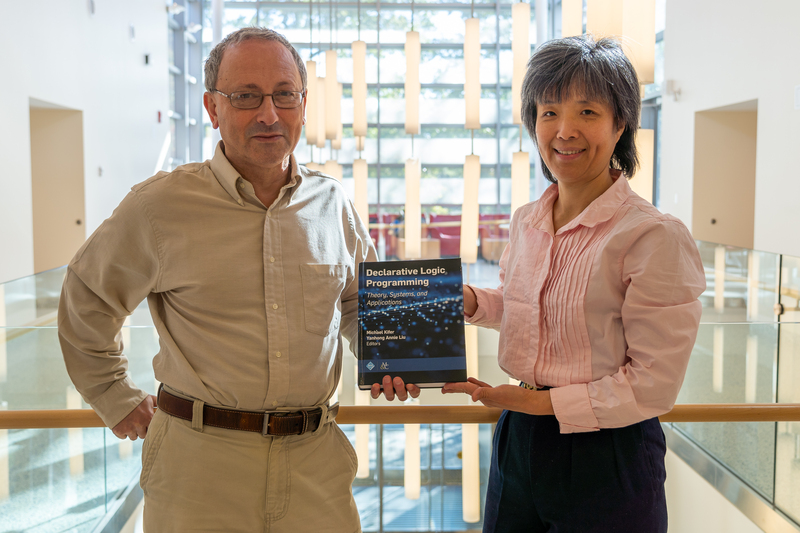 To shed light on the methods that allow these systems to operate, Y. Annie Liu and Michael Kifer, professors in the Department of Computer Science (CS) at Stony Brook University, have co-edited the book Declarative Logic Programming, released in September 2018. Logic programming (LP) is integral to artificial intelligence, mathematical logic, knowledge representation, and programming languages. LP is unique because it allows the system developer to focus on what to do, instead of the more traditional method of specifying all the details of how to complete a task. Kifer and Liu were inspired to create this text after organizing a symposium on this subject at Stony Brook in 2012. This event celebrated the work of David S. Warren, Professor and former chair of the CS department, to whom the book is dedicated. Kifer and Liu noted that there was dearth of literature that described the fundamentals of LP in a way that most non-experts could understand. The book contains information on the theory, systems, and applications of logic programming addressing specific topics such as probabilistic logic programming, predicate logic as a modeling language, bioinformatics, natural language processing, and more. If the goal of this book is met, its readers could advance LP to develop systems for a brighter future. Michael Kifer is a professor at Stony Brook University’s Department of Computer Science. He has made significant breakthroughs in the areas of databases, logic programming, knowledge representation and reasoning (KRR), and semantic web in over 30 years of research. Among his many achievements, he has been awarded three "Test of Time" awards from the Association for Computing Machinery (ACM) and the Association for Logic Programming (ALP). He is also a recipient of the State University of New York Chancellor’s Award for Excellence in Scholarship & Creative Activities as well as a CS department’s Service and Research Excellence awards. In addition to his role at Stony Brook, Kifer serves on the editorial boards of several computer science journals and has chaired a number of conferences. Kifer also co-founded Coherent Knowledge Systems, which focuses on semantic and KRR technologies. Kifer earned his PhD in Computer Science from the Hebrew University of Jerusalem, Israel. Yanhong Annie Liu is a professor in the Department of Computer Science at Stony Brook. Liu earned her PhD in Computer Science from Cornell University. Her Design and Analysis Research Laboratory tackles challenges in modeling and specification, analysis and verification, design and optimization, code generation, and testing. Primarily Liu’s research involves languages and algorithms, especially on systematic design and optimization. Liu is a recipient of the State University of New York Chancellor's Award for Excellence in Scholarship & Creative Activities.